POS inventory systems are considered business cash registers. “POS” stands for “point-of-sale”. In simple terms, this is defined as when and where transactions are completed. As the owner of a retail business, POS inventory systems are essential for your success. These systems are used to record and maintain all sale and customer information. Furthermore, a good POS inventory system will always keep your data organized and available to you. Read on to discover why retail businesses need POS inventory systems. You are able to track your return on investment (ROI) with POS inventory systems. If you currently are unaware of which products are top sellers, you probably are not profiting as much as you could. Without the understanding of how those top sellers were sold, you are losing out. Additionally, you should know which promotions have been the most effective. You need this knowledge in order to increase sales and expand your business. Furthermore, you need it to advertise your business effectively. 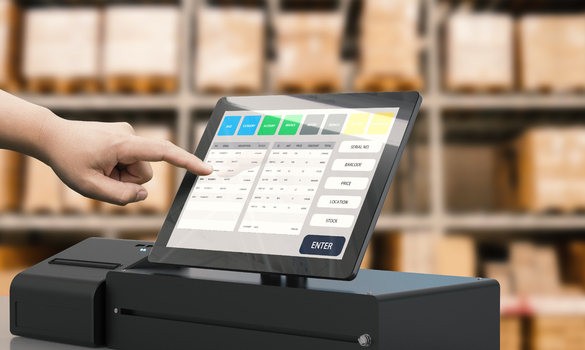 With a POS inventory system, you can have this knowledge at your fingertips. You will gain tools such as analysis reports and gross margins. These tools allow you to make sales adjustments when necessary. Then, you can increase your sales and grow your company. As a retail business, this is a major advantage. Another reason retail businesses need POS inventory systems is for branch routing. With this tool, you will create better customer experiences. For instance, consider a customer is shopping in one of your store locations. They want a sweater in a size medium. Unfortunately, that specific location does not have that size in stock. With branch routing, you are able to sell them the sweater from another location. They can either pick it up from the other location, have it shipped to their current store location, or have it shipped to their home. POS inventory systems provide you with those options with branch routing. Therefore, they will keep your customers happy while simultaneously acting as one of many sales strategies. POS inventory systems also provide another customer service feature: customer management. Point-of-sale systems allow you to keep customer data all together. There are numerous types of data stored. Firstly, each customer’s history is stored. Secondly, POS inventory systems maintain customer lists. They even keep track of discounts offered to customers. Since all of this information is kept in one place, all of your store locations can access it when necessary. A single storage location also enables easier, faster syncing between branches. Your customer service reviews will shoot through the roof with POS inventory systems. In contrast, your storage costs will not go through the roof with POS inventory systems. Instead, they will decrease drastically. A decrease occurs due to efficient inventory tracking and management with the systems. Storage costs typically sky rocket due to product excess. With accurate storage, you are less likely to have extra merchandise. Therefore, you will not have to pay extra for more storage. With a POS system, you can determine which products are selling and which are not. Then, you can offer sales to get rid of your extras before having to pay to store them. If you are attempting to better finance your business, this is very beneficial. With a POS inventory system, you can save yourself from making a hefty storage payment. Lastly, POS inventory systems have a built-in bookkeeping feature. In addition to tracking your inventory, you can also track your company’s finances. Business owners sometimes lose themselves in their manual accounting processes. Others rely on consultants and simply do not understand their financial situations. With a POS inventory system, you can use accounting software to maintain and understand your finances yourself. The built-in system will automatically process your sales and invoices. Therefore, you will be able to keep track of the numbers at all times. Built-in bookkeeping is a very beneficial feature POS inventory systems offer retail business owners. POS inventory systems are referred to as business cash registers for good reason. They track return on investment. The systems also provide branch routing, which creates more customer satisfaction. Better customer service is also built through the systems’ customer management tools. You will decrease your storage costs with a POS inventory system. Additionally, you will have access to built-in bookkeeping. These are all reasons why retail business owners like yourself need POS inventory systems.